Simon Allen and Eddie Roberts had played together as The Mastersounds, though with a different bassist and no organ. Through friends and the intimate nature of the Leeds (UK) music scene, Pete Shand and Bob Birch were added on bass and Hammond respectively and The New Mastersounds were born. Though it was raw, and more of a boogaloo sound at first, it was powerful from the start. Their first rehearsal was hot enough for Blow it Hard Records to release on two limited-edition 7” singles. Fast-forward 15 years and the recorded catalogue boasts 24 more 7” singles, 9 studio albums, 2 live albums, 1 remix album and 3 compilation albums, released variously in UK, USA and Japan, where they continue to tour extensively. Joe Tatton, another veteran of the Leeds scene, joined back in 2007, replacing Bob Birch on organ and piano. As an example of the respect this band commands, Peter Wermelinger – DJ, collector, and author of the crate-diggers’ bible The Funky & Groovy Music Lexicon – places the 2001 NMS track “Turn This Thing Around” in his all-time top-ten tunes, along with the likes of Eddie Harris, Funkadelic, and Herbie Hancock. 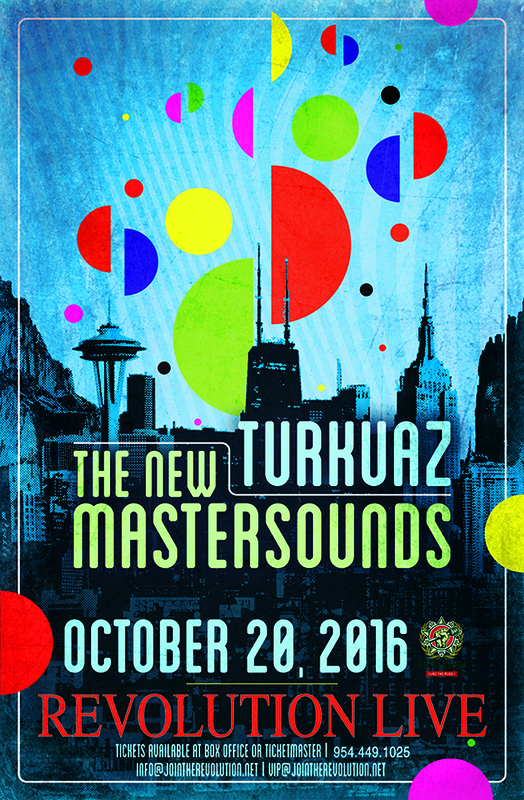 The New Mastersounds are at the very top of an elite selection of acts that bring the true soul out of funk. Turkuaz is a 9-piece “Powerfunk” outfit from Brooklyn, NY, whose modern take on the classic funk sound has established them as leaders in the funk revolution that’s currently taking place in the genre. Blending elements of Pop, R&B, and Soul with their distinct aggressive funk core, Turkuaz sounds like the musical love child of Sly & the Family Stone and Talking Heads. Turkuaz’s sound is more accessible than ever and poised to break out to a more mainstream audience. With a playful feel that evokes the best of 80s dance music, Turkuaz’s tightly arranged songs are built on thick grooves, driven by powerhouse rhythm and horn sections, as well as four distinct vocalists.